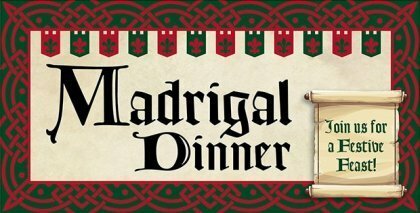 Olympia High School proudly presents the 2018 Madrigal Feaste - “Stars in the Night” - on Friday November 30th and Saturday December 1st at Castle Olympia (formerly Olympia High School Gymnasium). It is once again time to put away the cares of the modern world and step back in time with nearly 150 Olympia Music students in this annual spectacular - to the days of the renaissance when guests were welcomed by the hundreds, entertainment was non-electronic, and the season of Christmas was ushered in with good friends, good music, good entertainment, and good food! A sumptuous dinner of Wilde Beaste, Ye Olde Greene Beans, Parsley potatoes, appetizers, and an exquisite dessert is to be expected! The Olympia Chamber Choir, Court Singers, Madrigal Brass, Madrigal Woodwinds, Madrigal Masque, and Olympia 8th Grade Chorus are all featured at this seasonal celebration. This production is under the direction of Andrew Gallegos – vocal, Mitch Lutz – instrumental, Jared Wade – drama, and Carol Birkey – costume designer. The cost of the Feaste is $20.00 per person but rise to $25.00 after November 15th. Children 10 and under are now $12.00 but will rise to $20.00 after November 15th. Take advantage of the early-bird sales! Reservations are required, and both shows always sell out! Ticket order forms may be picked up at the OMS or OHS front offices. Please send an email to OHSMadrigals@gmail.com or call 309-275-6346 with any questions! Don’t delay, order your tickets today! !